Prostat Corporation | ESD Blog » Why am I getting different resistance measurements on a ESD tray? Home > Uncategorized	> Why am I getting different resistance measurements on a ESD tray? Why am I getting different resistance measurements on a ESD tray? Someone asked a question regarding measuring a tray with 2 different resistance instruments and getting totally different readings. The tray being used for the measurements was an uneven tray. Soft contact surfaces indicate the optimal potential performance of a conductive material load, but do not necessarily represent what a device with metal contacts will see. Also parallel bar instruments are intended to measure flat, regular material surfaces and are intended to measure the effect of many parallel paths across the material between the two bars. Using these instruments for Point to Point measurements are different than area measurements and will provide different measurement results. In this case they are simply indicators and not specification measurements. rings with its micro probes – the PRF-922B, PRF-912B, etc. 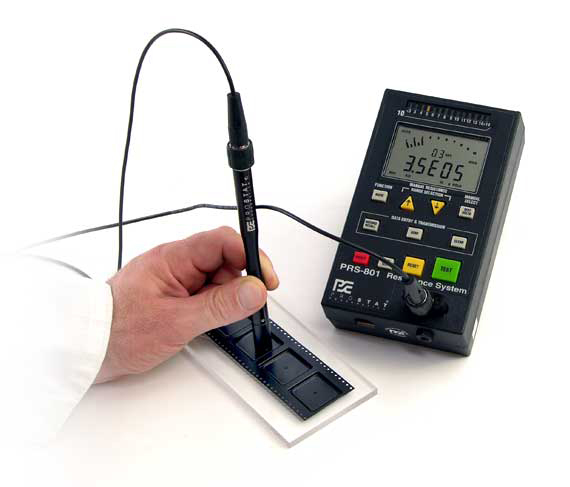 Assuming a PRF-922B fixture, measure a conductive tray with the boots on and record the measurement(s). Do not use excessive pressure. Then remove the boots and measure the same area, and record the measurement(s). Do not use excessive pressure. If the two measurement sets are very similar, the conductive loading in the polymer is quite homogeneous. If both measurements are within desired range, the tray material process and forming is good, and acceptable. If the two measurements are quite different – i.e., 2 to 3 decades or more apart – the conductive loading in the polymer is NOT homogeneous, or there are surface characteristics that inhibit the materials dissipative performance. The measurements WITHOUT the soft conductive boots is most likely what a device’s leads will see when in contact with the material’s surface. The measurements WITH the soft conductive boots is how the material will perform when a soft conductive device makes contact with it. Most electronic devices are not soft, so the measurement without comparison to that without the conductive rubber is not very valuable. These measurements are typically used the indicate the material’s dissipative performance characteristics to the end user. Again, check with the ESI-870 on different flat materials and you will see whether it is functioning correctly, or not. Simply hold it in the air and press the TEST button. It should indicate high or over level. Then place it on a clean metal surface and it should indicate its lowest measurement. If all is well, nothing is wrong with the instrument. It is not better or worse than any other indicating instrument: They are indicators, not specification measurements. You need to know how to use them and understand the differences in fixture contact surfaces. Tips for Making Precesion Measurements with the Prostat PRS-801 Resistance Meter Error in Prostat Autoanalysis – Invalid extremum sequence! Minimum has to be followed by a Maximum! Error in Prostat Autoanalysis – Invalid extremum sequence! Minimum has to be followed by a Maximum!